A spectacular new dinosaur attraction is coming to Trafford Golf Centre, in the form of one of the UK’s biggest adventure golf courses. Work has started on ‘Dino Falls’, an 18-hole adventure golf course, set within an incredible ‘Jurassic’ setting next to the M60 (Junction 10) at Trafford Golf Centre. 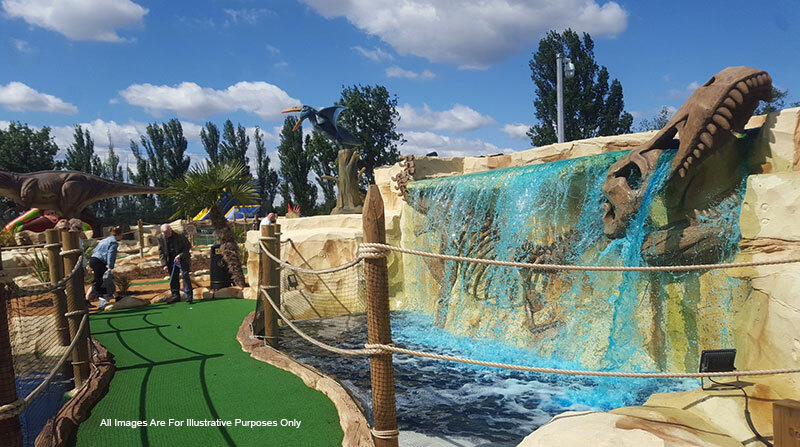 Gigantic moving dinosaurs will feature around the course, including a water-spraying Pterodactyl, at what will be one of the most impressive adventure golf sites to be created in the UK. At almost 5000sqm in size, Dino Falls will feature dinosaurs as high as six-metres tall, ‘fossil’ paths, huge boulders, caves and a dramatic three-metre high waterfall leading into a river and lake. Pete Styles, Director of Golf, at Trafford Golf Centre and the soon-to-launch Dino Falls, said: “This is exciting news for Manchester and we’re expecting this to be one of the busiest adventure golf sites in the UK. “Dino Falls will cater for the ever-growing leisure market within TraffordCity, adjacent to the intu Trafford Centre, providing a memorable and fun activity for families, couples, children’s parties and corporate and school groups. Around 70 tonnes of artificial rock, along with 340 tonnes of concrete, are being shipped to the site to create this dramatic adventure golf course. The ‘Jurassic’ setting will be further enhanced with more than 500 specially selected plants from palm trees to shrubs. Aside from the gigantic dinosaurs, the biggest attraction will be the impressive waterfall with more than 1,500 gallons of water falling over the face every minute into a specially created river. Dino Falls will incorporate an educational element with two rooms available for school classes or parties, along with fact-finding around the site, providing an opportunity to learn more about dinosaurs and the prehistoric period. The site will be the biggest 18-hole dinosaur adventure golf course out of London and is due to open in Autumn 2017 and compliments the existing Trafford Golf Centre facilities which includes a ‘We proudly serve Starbucks Café and Bar’, 62 bay golf range, seven PGA professionals teaching from the Academy and the leading American Golf retail store in the North. In 2016, Trafford Golf Centre hit over 11.5 million balls, which it one of the busiest golf ranges in Europe. Sign up with your name, email address and date of birth to receive exclusive deals, previews, news and updates. Thank you for submitting your details to receive our latest offers and Dino news!